SAN FRANCISCO - Lost in all the Strickland-Harper excitement was the fact that the Giants were shut out Monday. They did get on the scoreboard a day later, but the end result wasn't any better. 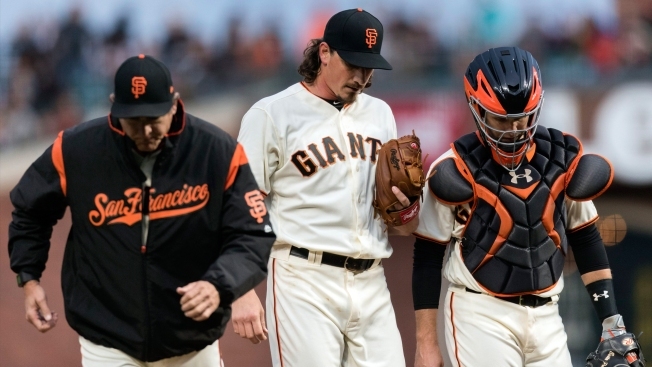 Jeff Samardzija lasted just four innings against a tough Nationals lineup and the Giants couldn't dig out of an early hole, falling 6-3. They have dropped the first two games of this series and now they'll face Max Scherzer. --- Samardzija's bizarre night: 4 innings, 100 pitches, 9 hits, 3 earned runs. Per Baseball Reference's play index, Samardzija is just the second Giants starter to post that line. Barry Zito (of course) did it in 2007. --- Samardzija became just the fourth pitcher in MLB history to throw 100 pitches in four innings without issuing a walk. Rick Porcello last did it in 2012. In six May starts, Samardzija struck out 49 batters in May and walked just one. --- Orlando Calixte hit a single up the middle in the first, getting his first big league hit. He later doubled home two runs. The Giants think there's a legitimate contributor here, a six-position player who can help off the bench. Calixte showed some of his versatility in the late innings when he shifted from left over to center, and then to right. He is the first Giant to play all three outfield positions in a game since Randy Winn in 2009. --- There's a better way to get revenge on Bryce Harper. He was 0 for 5 and struck out three times. He was booed lustily before every at-bat. --- The Nationals said they did not intend to retaliate, and they stuck to it. Buster Posey did not get one in the ribs, and he took advantage of his opportunities to hit. Posey walked in his first plate appearance and then notched three straight singles.